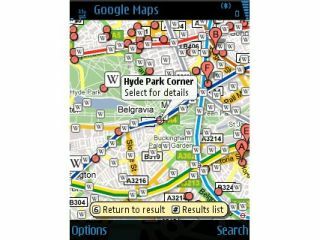 Google has announced it's updating Google Maps for mobile to include voice search for your Windows Mobile and Symbian S60 phones. This means that when you want to look up a place to go to, simply press the 'call' key and state your intentions to the phone – and it can recognise some pretty obtuse questions apparently. You can ask it to search for a specific address (17 Rue de la Mer), a business (Starbucks) or a type of place (coffee shops). If your phone is GPS enabled, it will search in the immediate area – but you know how Google Maps works already, and this is just a voice option on top. Ey lad, gooin' up t'shops, where be Costa? There will also be a redesigned settings page, with 'many English accents and Mandarin Chinese' supported too according to Google. This seems to be related to the announcement of Google Maps Navigation in the UK yesterday, where Android phones in the UK are now capable of running as full san nav devices. We can't see why you'd be desperate to voice search when walking around town on your WinMo phone – while yes, it is easier, you have to reconcile that against looking like a fool shouting commands at your mobile phone.